We have made it to Southeast Asia and the second section of our trip! Our first stop in Southeast Asia was Indonesia. When researching where we wanted to visit in Indonesia we realized that Indonesia is a huge country and we weren’t going to have enough time to see everything we wanted so we settled on visiting Gili Air, Bali, and Flores (Komodo). After visiting this part of Indonesia we know that we will definitely be back in the future. Watching the sunset over Bali’s volcano Mount Batur. 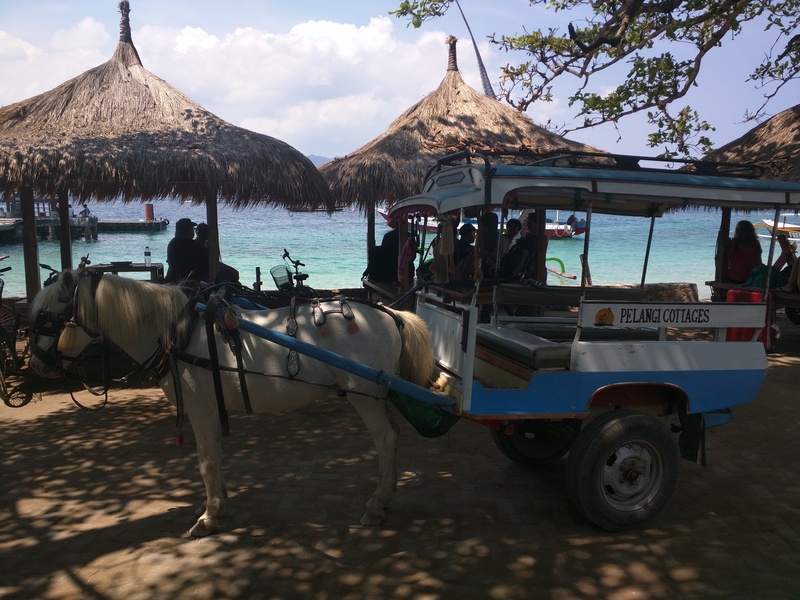 Our first stop on our Indonesian adventure was visiting the island of Gili Air. The Gili Islands are three tiny islands about a 2.5 hour fast boat trip from Denpasar, Bali. 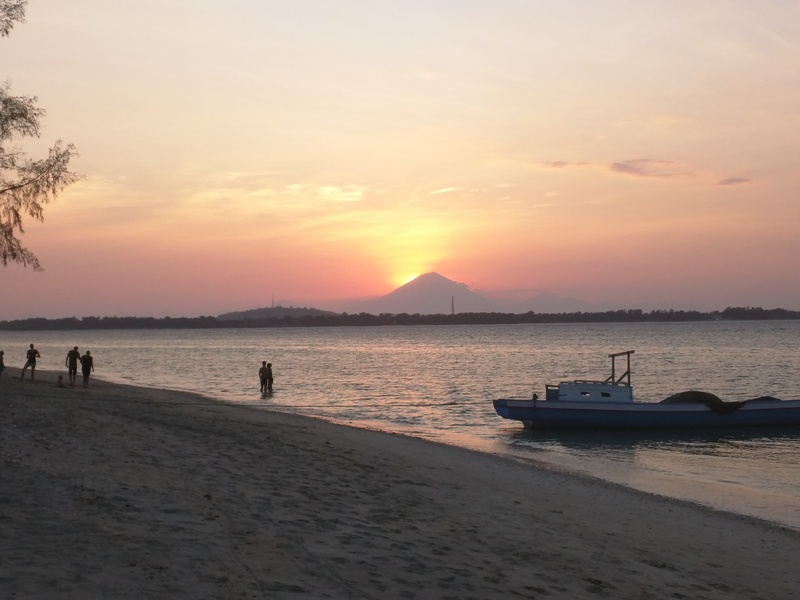 We chose Gili Air because it is more laid back than Gili Trawangan and more exciting than Gili Meno. The island doesn’t have any motorized transportation so the only ways to get around the island are to walk, bike, or take a horse cart. There isn’t much to do on the island except scuba dive, snorkel, and relax on the beach so don’t head here if you are looking for a busy bustling city. Horse Cart the only way to get around. We were really excited to visit the islands and Indonesia because it is known for its amazing coral reefs and fish. The diving on Gili Air was really great and we were able to see tons of coral, turtles, schools of fish, and sharks! Because we couldn’t spend our entire trip scuba diving we also rented bikes one day and “biked” around the island. It takes about 45 minutes to bike around the island and could be faster but half of the island doesn’t have a great bike path and you are forced to push your bike through thick sand instead of riding it. Needless to say we probably could have walked around the island more quickly! Bike riding/pushing around the island. Only 1743 kilometers back to Singapore and 0 kilometers to Paradise! Another night while we were on the island we took an Indonesian cooking class and learned out to make an Indonesian dessert (Kelopan), yellow curry, mie goreng, peanut sauce, chicken taliwang, and gado-gado. Indonesians make their peanut sauce in a flat mortar and pestle and it is awesome. We are definitely going to bring back some chicken satay back to the states. 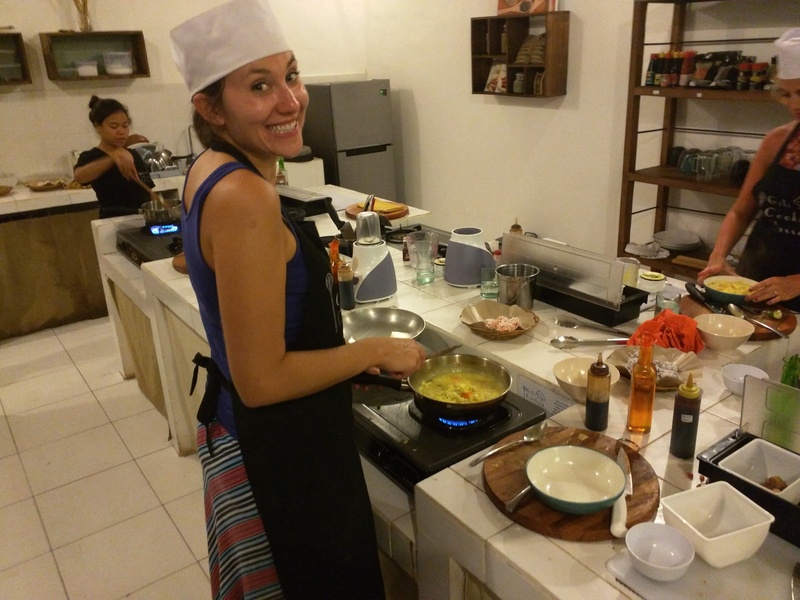 The best part of the cooking class was when we were making the mie goreng (fried noodles) and had to add the “white pepper” from Lombok. The instructor told us to taste the “white pepper” which he thought was a mix of coriander and white pepper but once we tasted it we really knew what is was, delicious MSG. You can’t make real misa goreng without the MSG it is just not the same. The Indonesian’s also have an awesomely named condiment called Kecip Manis (pronounced Ketchup Mayonnaise) that is kind of like a sweet soy sauce. If you want the recipes there are on their website. 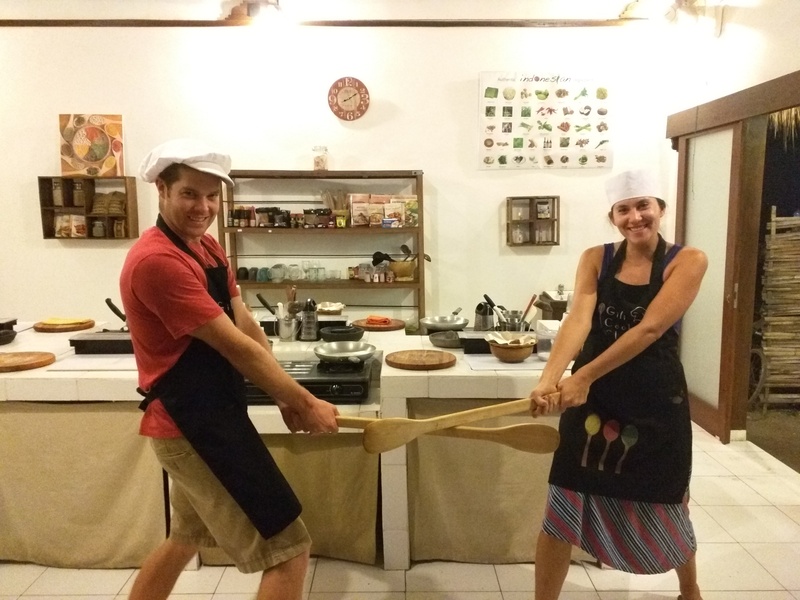 Big spoon battle at Gili Cooking Class. Finishing up the yellow curry. While on Gili Air there was a full moon and the island gets a little bit busier for the full moon parties. Since we had to leave the next day we didn’t party until the sun came up but we did have an awesome dinner on the beach at Scallywags. Indonesia is awesome because the food is really affordable and even at a nice dinner we only spent like $40. 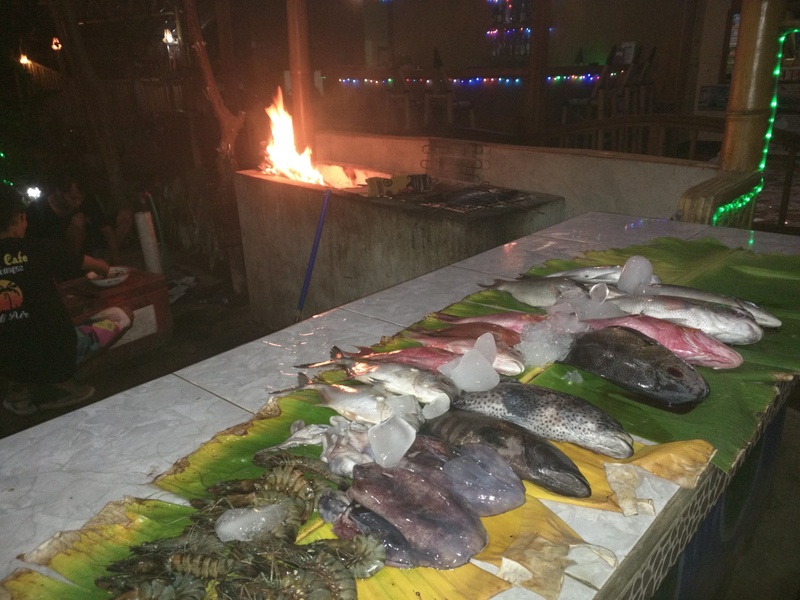 You can also get really great fresh seafood on Gili Air and a lot of the restaurants have daily catch fish outside their restaurants so you just walk up pick your fish and they grill it for you and serve it with rice and vegetables. Dan said he had the best grouper he ever had at one of these restaurants, Wiwin Café, and it was only 100 IDR or about $7. Local caught fish, calamari, and shrimp. That delicious spotted grouper was our dinner. 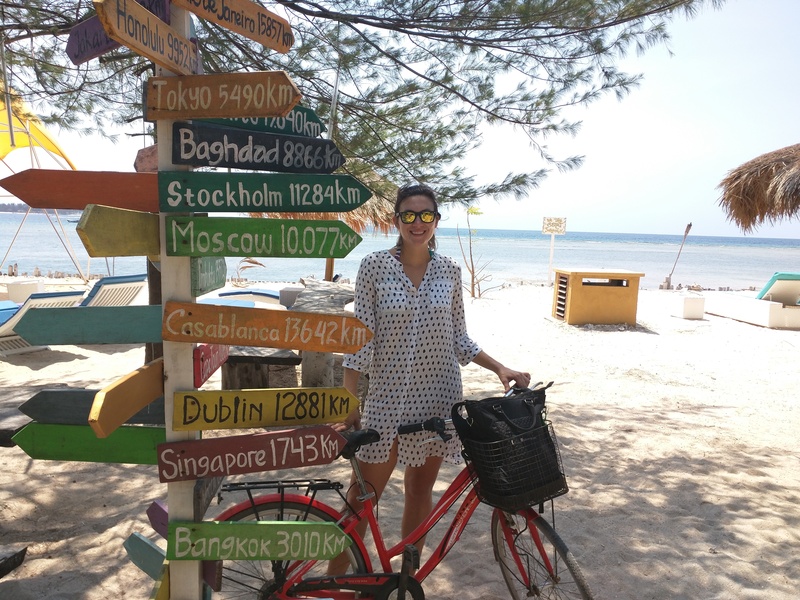 Gili Air was a great place to chill out and enjoy the beautiful crystal clear water and white sand beaches. You can see from the rate of construction that this island is not going to be the quaint quiet island for long so get here before it gets too busy and loses its charm. Scuba Dive – If you aren’t certified this is a great place to learn. Eat freshly caught grilled fish on the beach. Walk/Bike to the other side of the island, find a cabana and a cocktail, and enjoy the view. Watch the sunset over volcano on Bali. Get a Balinese massage (maybe everyday) there are only like $9 USD for 90 minutes.